ST. GEORGE — An estimated 39 million people will be hitting the nation’s roadways over Memorial Day weekend. Here in Utah this weekend also marks the beginning of the “100 Deadliest Days of Summer” and authorities are working overtime to help keep people safe. Over the last three years more than 300 people in Utah have lost their lives during the 100 Deadliest Days. That’s one death a day, every day, according to information released by Utah Highway Patrol Trooper Jared Cornia Friday. Historically, fatal crashes nearly double in the summer compared to the rest of the year. Those statistics are behind the reason why the days between Memorial Day and Labor Day have been designated as “The 100 Deadliest Days,” according to Zero Fatalities Utah. 301 individuals were killed on Utah roadways over the past three years. 89 (30 percent) of those fatalities were not wearing a seat belt. 67 (22 percent) deaths involved a speeding driver. 35 people (12 percent) were either impaired or involved in a collision with an impaired driver. Research provided by the Utah Department of Public Safety shows that 94 percent of all traffic crashes are caused by human error. Five of the contributing factors are failure to buckle up, speeding, driving distracted, drowsiness and driving impaired. The research also shows that many drivers often risk traveling at higher speeds during summer months and more than 80 percent of all crashes occur during clear skies on dry roads. There are also more trailers, RVs and large equipment traveling on the roads and those bulkier vehicles need a greater stopping distance and have a bigger blind spot to contend with. 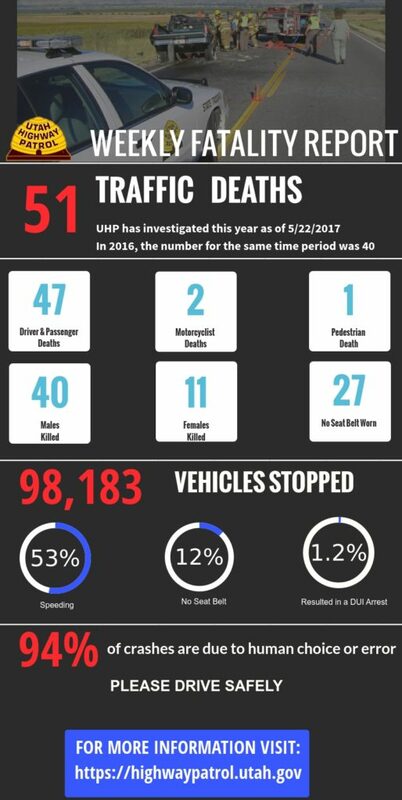 The Utah Highway Patrol has investigated 51 fatal crashes that killed 41 people so far this year, up 28 percent over the same period last year. Authorities are working to change things. Enforcement efforts are in full force to change this deadly trend. “Let’s get you where you’re going, and let’s get you home safely,” Utah Highway Patrol Col. Michael Rapich said Thursday in announcing a concerted effort by the department to watch for dangerous drivers on Utah roads over the next few days. Troopers across the state will work 464 overtime shifts in addition to the regular duty shifts. Troopers on day shifts will focus on speed, seat belt use, aggressive and distracted drivers, while troopers taking overnight shifts will keep an eye out for impaired drivers. Additional troopers will work individual DUI enforcement shifts throughout the state, while the DUI enforcement squad will continue their efforts through the long weekend. The Click it or Ticket enforcement campaign is in full swing with troopers and officers from law enforcement agencies throughout the state on the lookout for drivers and passengers who aren’t buckled up. During a crash, being buckled up helps keep you safe and secure inside your vehicle, whereas being completely thrown out of a vehicle is almost always deadly, the National Highway Traffic Safety Administration reminds motorists. All motorists must always wear a seat belt, drive sober, be alert, remove distractions and obey traffic laws, particularly the speed limit. A seat belt is the single most effective traffic safety device, reducing the risk of serious injury and death, while driving impaired significantly alters a driver’s ability to react and process information. “A car can have the latest technology, but if it’s not used properly then it won’t function in the manner that it was designed for,” Lt. Dave Crouse with the Washington County Sheriff’s Office said. Many drivers aren’t aware that the ‘SRS’ found in the middle of the console where the airbags are stored means “Supplemental Restraint System,’ which means they work in conjunction with the seat belt, he said. When drivers risk exceeding the posted speed limit, the risk for a serious injury or fatality in a crash increases. St. George Police Officer Ken Childs said now is a good time to remind drivers of what’s at stake if they don’t obey traffic laws. “We would like to reverse this trend and make sure that no one experiences the loss of a loved one because of a crash,” the Utah Department of Public Safety emphasized in a news release Friday. The Utah Department of Public Safety, the Utah Highway Safety Office and the Utah Highway Patrol will regularly post safety oriented messages and statistical updates throughout the weekend on social media sites. “The research also shows that many drivers often risk traveling at higher speeds during summer months “…..yeah Udot, this happens because you continue to raise the state speed limit, it’s now 80 mph, way to high, but you Udot are the cause, slow it the hell down or continue to see the roadway deaths continue to climb, you have the power to stop this….Most of the time now, here in southern Utah, we almost never see a UHP unit on the I-15, very rare sight indeed, so why slow down?